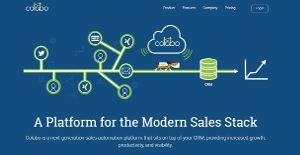 Colabo is a sales automation solution has helped businesses to link their sales tools and teams with the customer relationship management (CRM) tools. This has allowed them to increase sales through leads. Automation of sales by this software solution has equipped the sales team and tools with the ability to drive sales and increase revenue for businesses. It helps drive sales through increasing the productivity of your team, customer engagement, and automation of tasks. CRM is vital for you to build loyal customers. The Colabo marketing solution allows integration with leading social platforms to help engage with your potential customers and create more leads. It allows the creation of custom texts which are automated to increase the response rate for your target audience. With such automation, your sales and marketing teams can eliminate manual tasks and drive sales with minimum cost. Colabo is a modern sales solution software with the ability to integrate your sales tools with the social outreach. It initiates workflows in your businesses by allowing you to connect quickly with the social media and drive revenue growth on the same. Before Colabo, sales processes were unable to integrate with the social and thus limited increase in revenue. The workflows feature allows your sales team to automate tasks based on the successful sales strategies. Information about your target market will change now and then it can thus be difficult to keep track of those dynamic changes of your leads. The Colabo sales automation solution equips you with effective CRM synchronization by automatically updating information about your leads with the current data. It also informs your sales team when a new lead is found. Colabo allows the multi-channel engagement ability that lets you reach your target audience in time. This feature equips your team with the right tools and resources to create leads and grow revenue. It allows them to be at the right place and time, with the right lead and messages to execute the sale. It helps build relationships with your target audience for sustainable revenue growth. It achieves this through collaborating with reputable social networking platforms like Twitter and LinkedIn. It thus makes prospecting and social interactions easy and thus your sales team can bring results with minimum efforts. It is important to realize that hardly any software in the Marketing Automation Software category is an ideal solution that can fulfill all the needs of various company types, sizes and industries. It may be a good idea to read a few Colabo reviews first as specific software may dominate only in a very narrow set of applications or be created with a really specific type of industry in mind. Others can function with a goal of being easy and intuitive and therefore lack complicated elements welcomed by more experienced users. You can also come across solutions that focus on a broad group of customers and offer a rich feature set, however this usually comes at a higher cost of such a solution. Be certain that you're aware of your needs so that you choose a solution that has exactly the functionalities you search for. How Much Does Colabo Cost? We realize that when you make a decision to buy Marketing Software it’s important not only to see how experts evaluate it in their reviews, but also to find out if the real people and companies that buy it are actually satisfied with the product. That’s why we’ve created our behavior-based Customer Satisfaction Algorithm™ that gathers customer reviews, comments and Colabo reviews across a wide range of social media sites. The data is then presented in an easy to digest form showing how many people had positive and negative experience with Colabo. With that information at hand you should be equipped to make an informed buying decision that you won’t regret. What are Colabo pricing details? What integrations are available for Colabo? If you need more information about Colabo or you simply have a question let us know what you need and we’ll forward your request directly to the vendor.